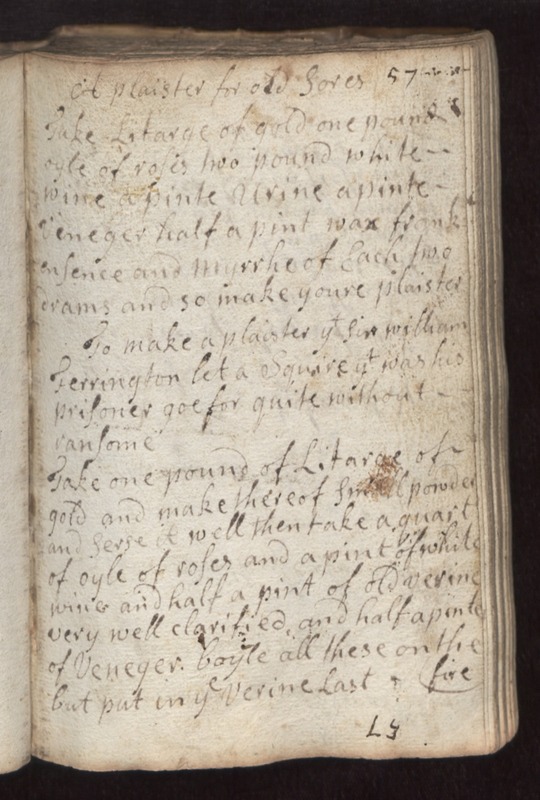 57 A plaster for odd sores Take litarge of gold one pound oyle of roses two pound white wine a pinte urine a pinte Vineger half a pint wax frankensence and myrrhe of each two drams and so make youre plaister. to make a plaister ye Sir William Ferrington let a squire ye was his prisoner goe for quite without ransome. Take one pound of litarge of gold and make thereof small powder and [serse?] it well then take a quart of oyle of roses and a pint of white wine and half a pint of old uerine very well clarified and half a pinte of veneger. Boyle all these on the fire but put in ye uerine last.